Bring the kids to the Chesapeake Campus for this spooky production that’s also family friendly. Bennett Logan plays Dr. Van Helsing alongside Jordan Tewari as Count Dracula. 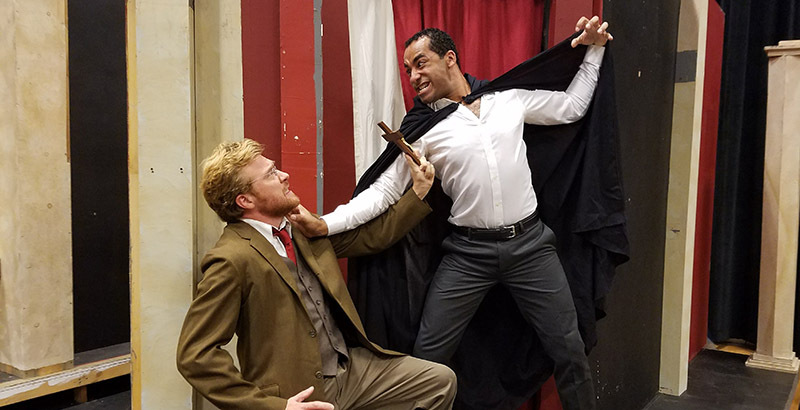 A spooky but family-friendly “Dracula” comes to life in Tidewater Community College Theatre’s fall production on Nov. 2-11. All performances will be held in the Black Box Theatre, which is in the Academic Building on TCC’s Chesapeake Campus, 1428 Cedar Road. The play opens with Lucy Seward being attacked by a mysterious illness. Her mother is the doctor in charge of a sanatorium. Desperate for answers, she calls in Dr. Van Helsing for assistance. Van Helsing determines that Lucy is a victim of a vampire, Count Dracula, who is eventually laid to rest in a novel manner. Performances will be held Nov. 2-5 and Nov 9-11. All shows start at 7:30 p.m., except for Nov. 5, which is a 2 p.m. matinee. Tickets are $10 for adults and $5 for students and seniors. Payment is by cash or check at the door. The box office opens 45 minutes prior to show time. For more information, call 757-822-5219 or email Matthew Gorris, assistant professor of theatre arts, at mgorris@tcc.edu.